A host of incredible students have been honoured at the Middlesex University Students' Union awards. Trophies were given to those who have made a special contribution to the lives of fellow Middlesex students, whether through running societies, organising events, representing their course mates or contributing to student media. 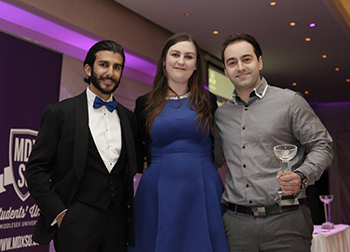 Among those awarded was LLB undergraduate Joseph Stoll (pictured above right with Students' Union President Aman Siddiqi and Vice-President for Art, Media, Performing Arts and Design Sarah Bennett), who was given the top prize of Student of the Year. "Joseph has made a sufficient impact on University life, establishing the first pro-bono legal advice clinic at Middlesex, which has helped over 100 people, from students to the wider community," the nominators said. "He has been a student learning assistant for two years and was also awarded the Lord Sheppard Award for Excellence in Law." Commenting on what the Student of the Year title means to him, Joseph said: "I feel very honoured to have attained this prestigious award. "The ceremony was very sentimental for me as it had reflected on my past achievements, and I thank Middlesex University's faculty and the Student Union's staff and president for enabling me to pursue these achievements and enhance my community." Others recognised at the awards ceremony, which featured entertainment provided by Middlesex music and dance students, included BSc Adult Nursing first-year Andrew Roy, who was named Student Voice Leader of the Year, and members of the Gaming Society, whose gaming nights and poker tournaments have proved a huge hit on campus. For the full list of nominees and winners, visit mdxsu.com.